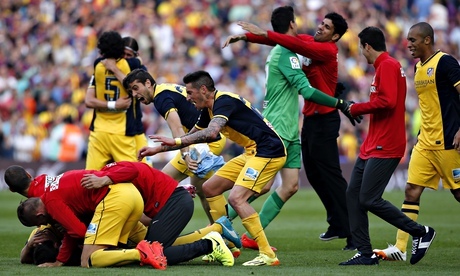 For the first time since 2004, a club not named Barcelona or Real Madrid has won La Liga. A decade after Valencia finished the season as champions of Spain, Athlético Madrid won the league for the 10th time in club history, holding off Barcelona at the Camp Nou. Atlético’s mission Saturday was simple. With a three-point lead over Barcelona entering the season finale, all Atlético had to do was not lose. A draw would give them the title. Predictably, Barcelona made it difficult. Alexis put Barcelona ahead in the 33rd minute, firing a rocket to the top corner from a ridiculous angle. It was the type of goal that deserves to win a league title. Diego Godin answered in the second half, towering above the Barcelona defenders on a corner kick. Atlético held Barcelona scoreless for the next 40 minutes, and after the final whistle, the home crowd gave the triumphant away team an ovation for winning its first league title in 18 years. Atlético players tossed manager Diego Simeone into the air in celebration. Atlético now has one game left to play this season — a Champions League final with Real Madrid.